San Francisco’s newest all star bar with a comedy name. Nothing particularly revelatory in this post since I suspect most of you guys have now been to Heaven’s Dog the new so-called all star bar in San Francisco. I made it out last week to check out the new menu and a few of the drinks. I had the Pan American Clipper; a mix of calvados, lemon juice, grenadine, and absinthe, the Bumble Bee; which was rum, lime, honey and egg white, and a Remember the Maine; a combination of rye, sweet vermouth, cherry brandy and absinthe. I particularly enjoyed the Pan American Clipper, though all the drinks I had were fantastic. All of the recipes are adapted from Charles H. Baker’s Book Jigger, Beaker and Glass, which they have many copies of behind the bar. I was impressed with the super attentive service, for example they even wiped the condensation off of my coaster between drinks. Ladies (and anyone else who carries a bag) will be pleased to know that they have another mark of distinction by having hooks under the bar. I also took note that they have a Kold-Draft ice maker, generally the mark of a bar that knows what it is doing, and that they were also one of the few bars in SF that are using large ice blocks in drinks, something that has been pretty common in New York bars for a while. 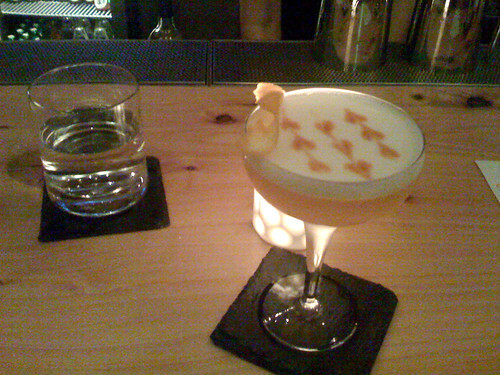 If you have even a passing interest in good cocktails make sure you get out to this place, I haven’t had a drink there I didn’t love, and you can’t really go wrong with an off night since all the bartenders are so good. This entry was posted on Thursday, January 29th, 2009 at 1:30 pm	and is filed under Bars, Books. You can follow any responses to this entry through the RSS 2.0 feed. Both comments and pings are currently closed.